NY TIMES FASHION LOVES NANDI MADIDA! 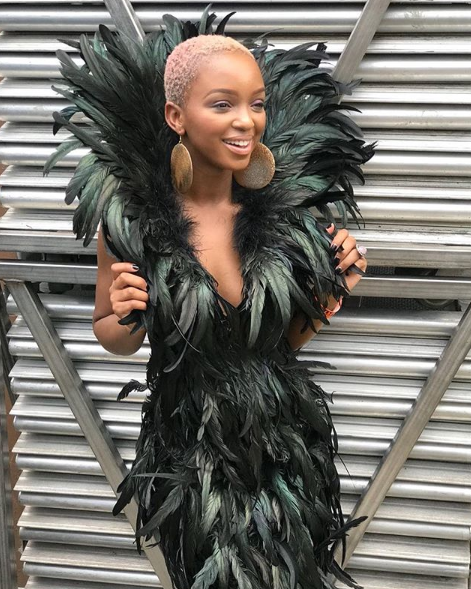 Our girl, Nandi Madida is no stranger to receiving love from international fashion publications whenever she works overseas. Remember when she wore that black and white dress from her debut COLOUR collection at the 2016 BET Awards in LA and the American fashion media couldn’t stop gagging over her? Well, she’s gone and done it again. Nandi was at Afropunk Brooklyn this past weekend where she became the first African to host the biggest stage at the event. She performed her host duties in a stunning green, feather dress. The look was such a hit, it’s been featured on the New York Times Fashion’s Instagram. The publication quoted Nandi as saying: “"It's almost like how heaven can be. We celebrate people who are willing to be daring because they're willing to be themselves. I love being different, unique and embracing fashion. In South Africa, and Africa as a whole, we love doing things that are out there. Anyone who has seen #AfropunkJoburg, you know that and have seen that”. New York-based illustrator, Alyssa Pollack also created a sketch of Nandi in the dress. Although Nandi hasn’t revealed who made the dress, we do know that the look was put together by local celebrity stylist, Gavin Mahlangu.